As an artist, I specialize in the world of animals. I have done numerous portraits of show dogs, horses and even people, beginning in the late 70’s. People call me the ~ Painter of Life, Texture and Spirit. I paint to capture the beauty and character of God’s creation… “Our animal friends,” and what exists around them. I’ve also explored the world of creative photography back in the early 70’s. My photographs helped to enrich my “original work” immensely. Not knowing at the time how serious and addictive I had become to my camera, this link to my art world has won me a number of winning photographs in different contests. My mediums: Oil, Colored-Pencil, Pastel and Ink. I also use my custom skills for framing, matting and oil painting repairs. My artwork is now exhibited in many private collections throughout the United States and Europe. If you are interested in adding my artwork to your home by commissioning a painting, or by purchasing T-shirts and other items imprinted with my photos, artwork or Art-toons, please click on the “Artwork,” “Photographs,” or either of the “Art-toons” you’ll find a link to an order form on this web site. If you are interested in commissioning your own work of art, please download a Contract for Artwork and Email Me to discuss your requirements and pricing. If you are unable to download the contract, please email me and I will send you one. I have created numerous commissioned pieces. And of course art for family and friends. I have also been commissioned for advertising signs with custom lettering. I create realistic fine art. My favorite mediums are oil, pencil and ink. My cartoons explore the humorous side of me. 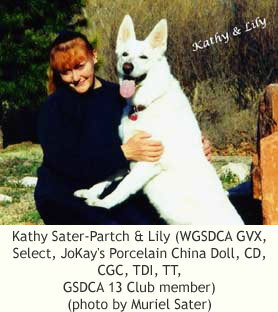 I began drawing the Sedona cartoons in 1989 modeled after my late white German Shepherd girl, U-CD JoKay’s Sedona, CD, CGC, OFA. I was asked long ago if I would do a German Shepherd Dog cartoon for a newsletter. I said, “I don’t do cartoon’s but I’ll think of something.” That’s how it all started. As I created the cartoon’s I kept adding more detail. My sister-in-law, Lynne Sater suggested I should start calling the drawings “Art-toons” because of all of the work I put into them. Sedona was always such a funny girl. Just living every day life with her, had given me most of my ideas. Almost every Sedona design is created from a photograph I had taken of her. I have hundreds of her poses yet to be used. Then I eventually added the funny dark sable guy, Otto with Sedona. Otto and Sedona are always teasing each other. I draw all of my “Art-toon’s” in full color now in colored pencil and/or ink. Each original design is 8.5″ X 11.5″. They have been published internationally. I have designed many T-Shirts using “Art-toons”. And now greeting cards will be available as other items. 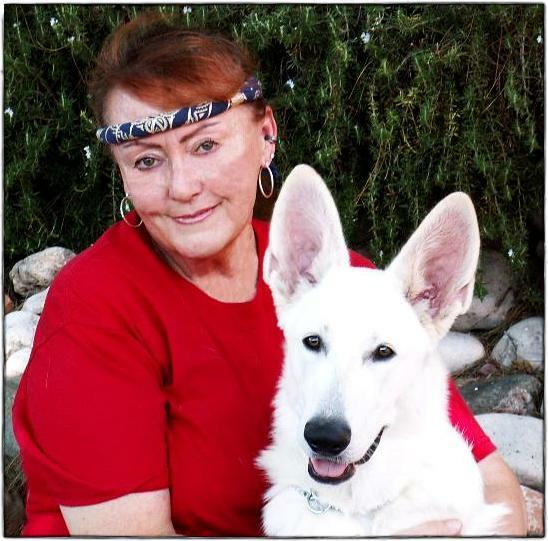 My main joys in life are my German Shepherds, family, friends, music and my art. 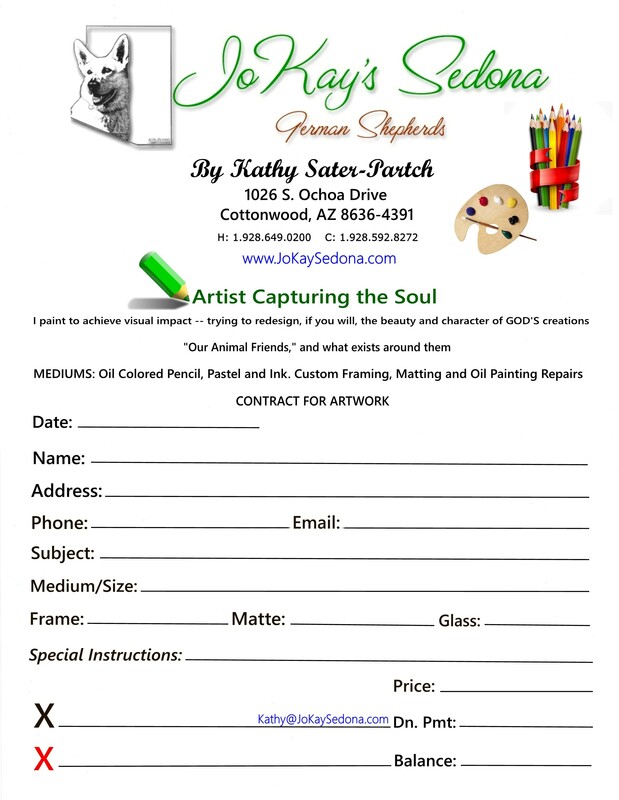 I hope my “Art-toons” of Sedona and Otto will bring a smile to your face.